Tab for admins in case if you need to login to the whole account. Voice services tab in case if you would like to login to specific number or Individual Services account. Under the ‘Services’ section, click on ‘Voice Services’. The new HPBX Admin Portal contains all the same functionality you are used to, with some useful improvements. Navigation links have been moved to the left hand side of the web page for consistency with other Intermedia web portals and some functions have been re-organized for easier navigation. The Resources section now provides you with easy access to helpful guides and downloads. 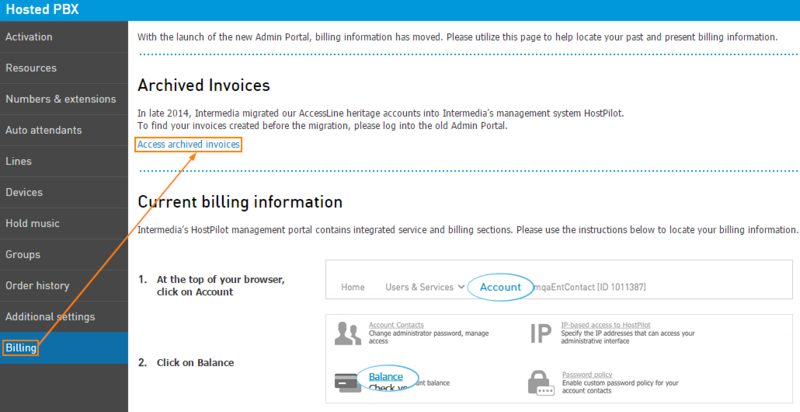 To view your old invoices, go to Billing > Access Archived Invoices.